We've spent the last two days traveling on Interstate 70. 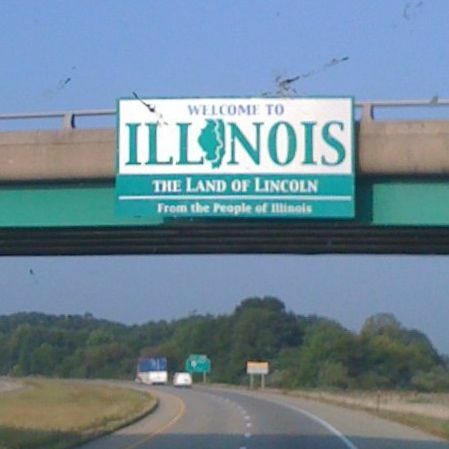 It's not the most scenic way to see Pennsylvania, West Virginia, Indiana, Ohio, Illinois and Missouri, but it's definitely the fastest. And, with 900 miles to cover, we were definitely looking for most direct route. We left Somerset County and traveled back across Western Pennsylvania. 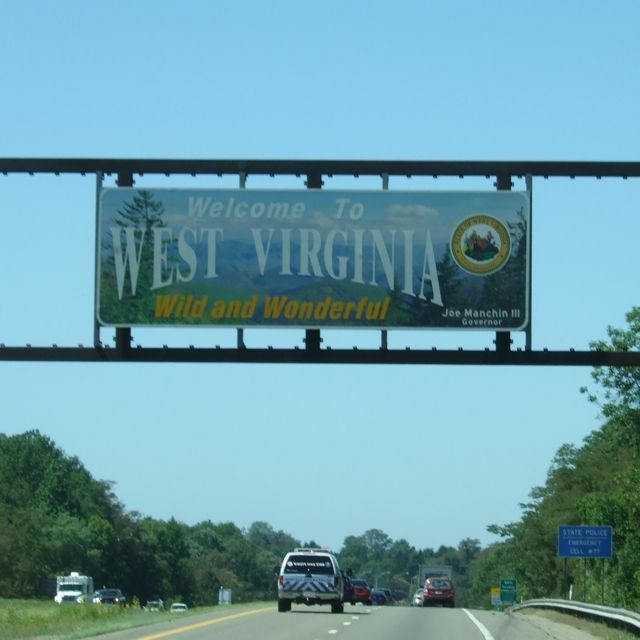 We crossed a wee little strip of West Virginia. 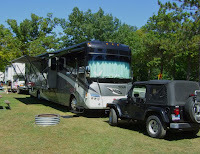 We were blessed with everything we could ask for to make this quick trip: wonderful weather and a weekend. We didn't see a cloud in the sky on Saturday, and experienced essentially no wind. 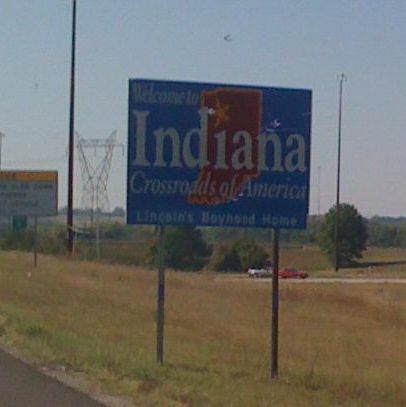 We were especially thankful for weekend traffic as we passed through several cities along the way. 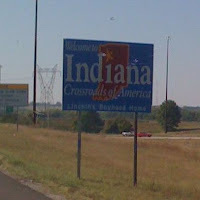 After covering 400 miles on I-70, we stopped for a quick overnight just east of Indianapolis. At the crack of dawn Sunday we were back on this now very familiar stretch of highway. 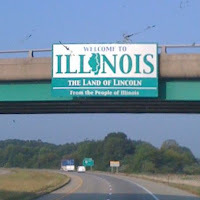 No state signs for Missouri or Kansas. (The photographer was behind the wheel.) But, we were very glad to see them both. 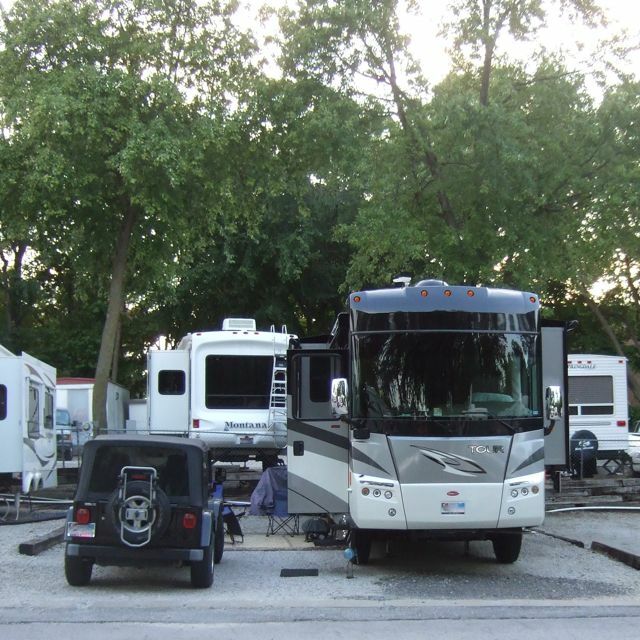 With 500 miles behind us on this sizzling Sunday, we made our way to our "home park" in Kansas City. With the moose settled in for a well-deserved rest, we readied the squirrel and ourselves for a busy couple of weeks with our families. And, we think we'll stay off of I-70 for awhile. Maybe a long while! Shortly after our arrival at our campground near Rockwood, our plans changed. Tomorrow we're hitting the road for Kansas City. So, we spent most of today preparing to travel. While doing our laundry in nearby Somerset, we struck up a conversation with a friendly local. She asked how long we planned to be in the area. We explained that our visit was being cut short and we have to leave tomorrow. "You have to visit Flight 93," she said with a soulful look in her eyes that instantly set our agenda for the rest of the afternoon. 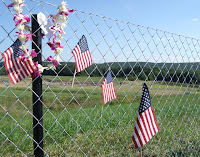 On the list of sites we had planned to see during our stay, the Flight 93 National Memorial was definitely on the list. Our local friend assured us it was a short drive away and definitely worth the trip. We decided to make the time. We're glad we did. The rolling hills of western Pennsylvania are scenic, in a peaceful way. Somerset County is quiet, rural and lovely. On September 11, 2001, ordinary Americans took extraordinary measures in the skies above this idyllic landscape and gave the ultimate sacrifice protecting others. Since that horrific day, the people of Somerset County have worked together with the Federal government to protect the final resting place of the passengers and crew of Flight 93 and honor their memory. What began as a makeshift organic memorial is now taking shape as a national memorial and one of the nation's newest national parks. Late last year, ground was broken for the permanent memorial. Its first phase is scheduled for completion for the tenth anniversary of the terrorist attack. Today, an old mining company shack that served as a command post for weeks after the crash now stands as a temporary memorial that tells the story of that day and honors the memory of the 40 heroes. A short path leads to a viewing area, which is separated by a chain link fence. More than one million visitors have come to this site to date, and many of them leave makeshift memorials on this fence. From the viewing area you can see construction of the permanent memorial, and to the right of that activity sits a green field with a single American flag in its center. "That is the sacred ground," explained the Ambassador standing near us at the viewing area. "No one but family members will ever stand on that spot." The Ambassadors are a network of local residents who have volunteered their time to be here to offer assistance to visitors at the site. They are here every day of the year to help people understand what happened and what is happening at the memorial. They experienced this tragedy personally and deeply. The account our Ambassador shared made the plight of Flight 93 even more real. What had been something we'd only read about or seen pictures of is now something that happened right here in this sacred place that we have seen, touched and smelled. We humbly paid our respects to the brave souls of Flight 93. We will never forget. 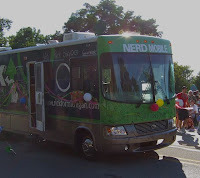 With "the hand" in our side view mirrors, we headed east. 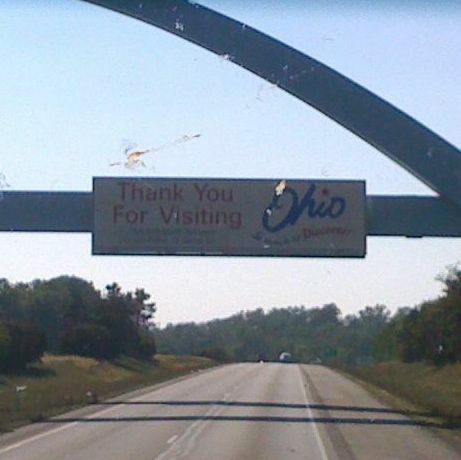 Our intended destination was "somewhere in Ohio" for a quick overnight. 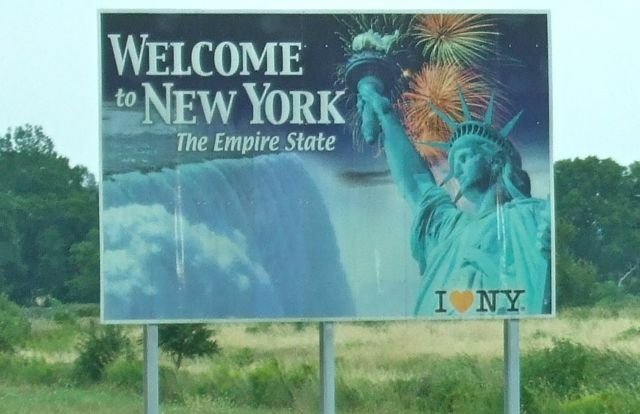 But, New York beckoned. So, we just kept driving and ended up at Sunday's destination on Saturday. We landed in North Tonawanda, just a few miles down the road from Niagara Falls. With an extra day to enjoy, we kicked back and relaxed. 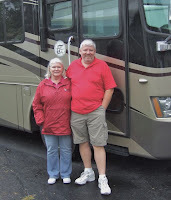 We were delighted to meet virtual travel friends Gary and Vicki, who stopped by on their way out of town on Monday. We enjoyed an interesting, and tasty, Greek brunch and sent them on their way up state. We thank them so much for making time to visit and look forward to seeing them when our paths cross again down the road. Today was our last day in New York. 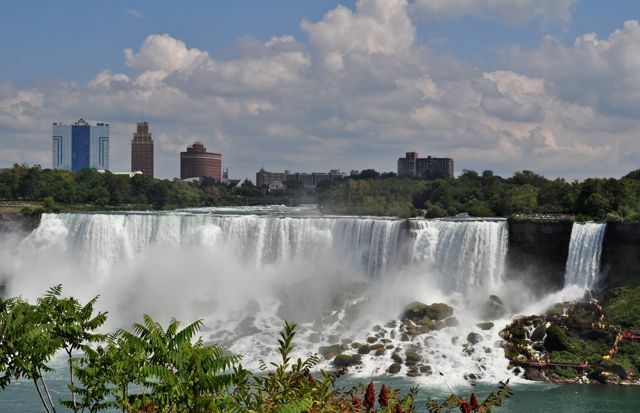 And, as it turned out, this was the most perfect day for visiting the falls. 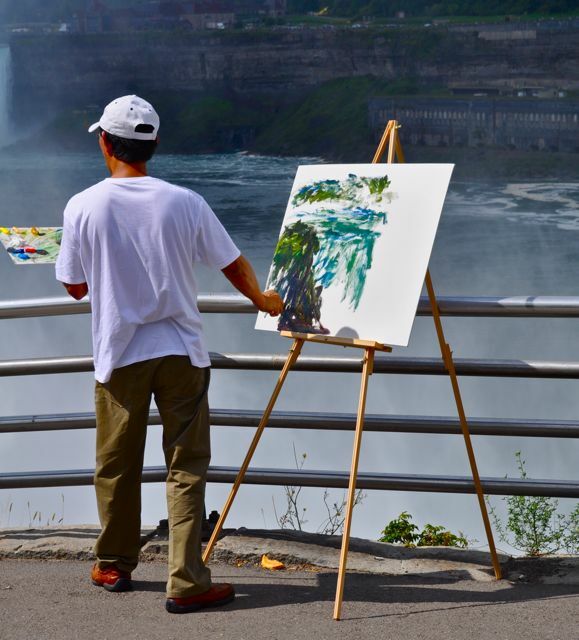 We checked in with a most helpful guide at the Niagara Falls State Park Visitor Center. (The park is the oldest state park in the US!) We told him we wanted to do some walking, and he lined out a most scenic route for us. 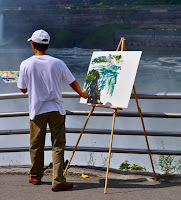 Our first stop was Prospect Point, which offered views of American Falls and Horseshoe Falls. Simply awesome. We took hundreds of pictures today. This young man painted one. And, what a subject! It was captivating to watch him work. We strolled over to Goat Island to a platform directly over the brink of Bridal Veil Falls. 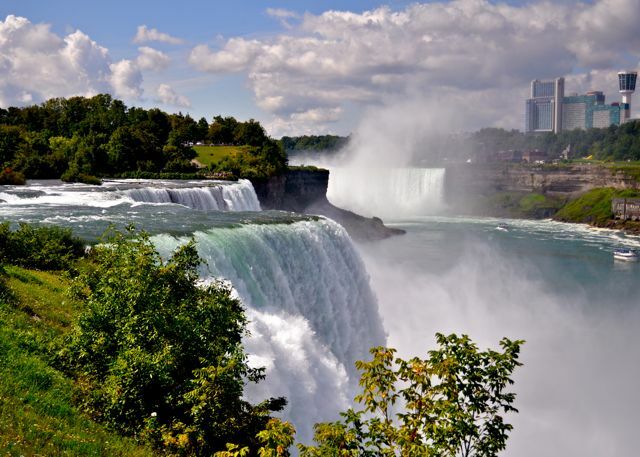 The view of some 75,000 gallons of water flowing over American Falls every second was a treat for the senses. We could see, hear and feel the power! 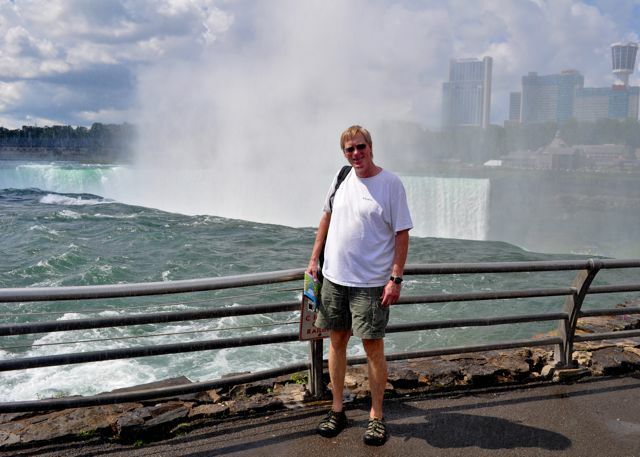 We strolled to the other side of the island to Terrapin Point for a glimpse of Horseshoe Falls. We couldn't see it all from here, but we could certainly hear it. With the breeze blowing over from the Canadian side, Paul got drenched posing for this shot. And, a microsecond after the shutter clicked we both headed for drier land! 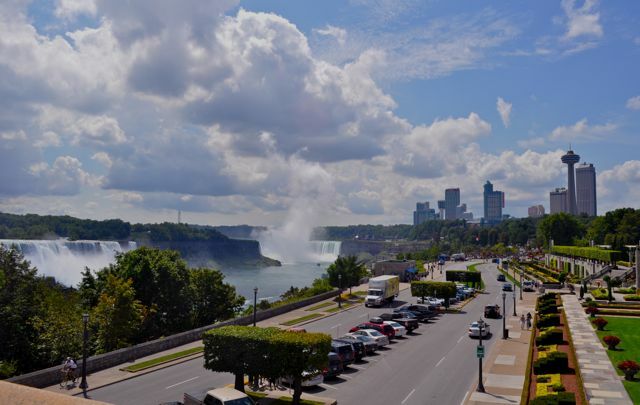 After taking in the stateside sights, we decided to stroll over to Canada. Here's the view from Rainbow Bridge. 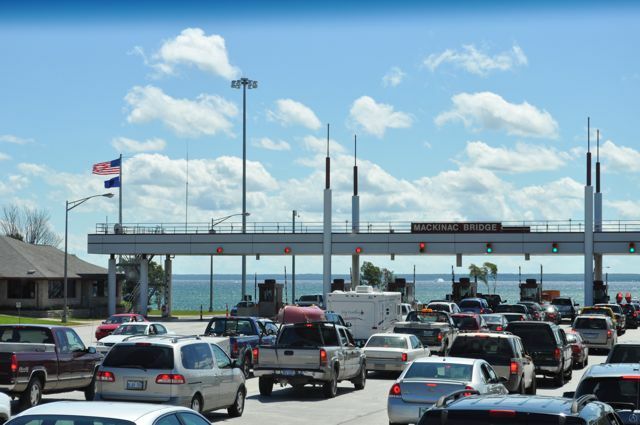 The United States is on the left and Canada is on the right. Queen Victoria Park lines the Canadian side of the Niagara River. It features colorful, well-manicured gardens, walking paths and the very best views of the falls. 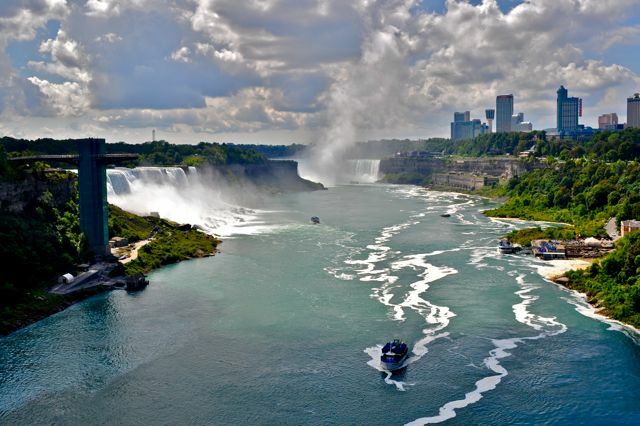 American Falls is on the left. The aptly named Bridal Veil Falls is on the right. 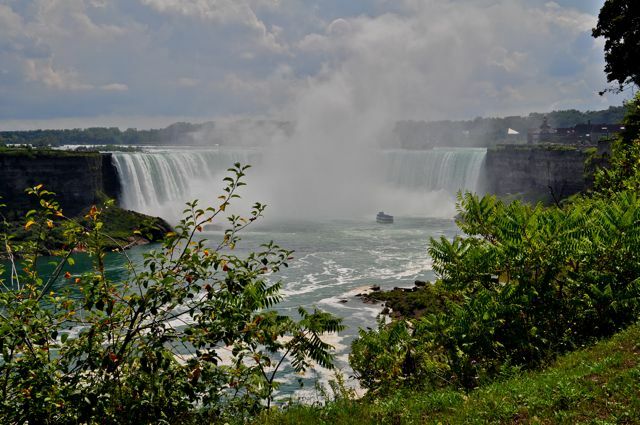 From the Canadian side, we enjoyed a full view of Horseshoe Falls. 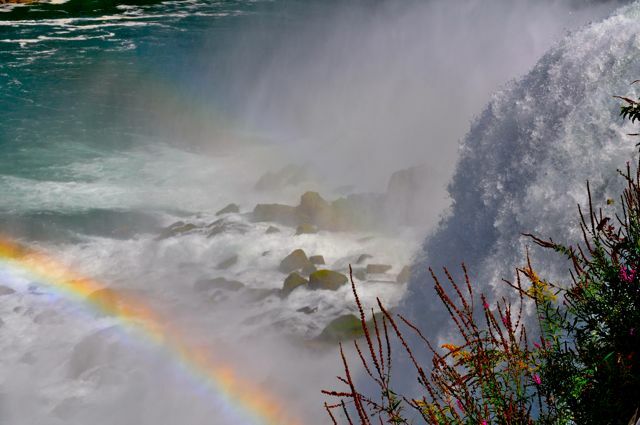 When 675,000 gallons of water fall with each passing second, it creates a lot of mist! 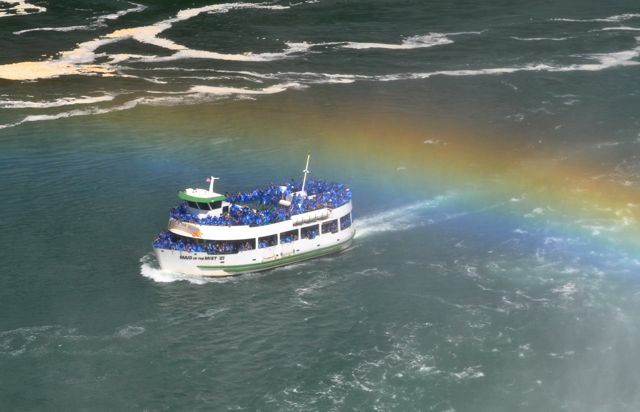 Speaking of mist, there's the Maid of the Mist, which offers tourists a chance to get up close and personal with the falls. Everyone on deck is wearing a blue rain poncho....for good reason! We had every intention of taking a ride today. But, after walking in two countries, we were ready to call it a day. We'll save the Maid for next time! 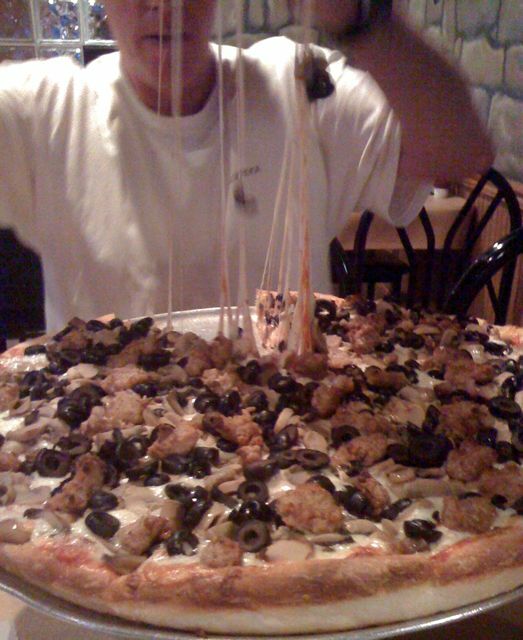 After all of that walking, we were hungry. We had scouted out a local star of the Food Network's Diner's, Drive-Ins and Dives and decided to check it out. 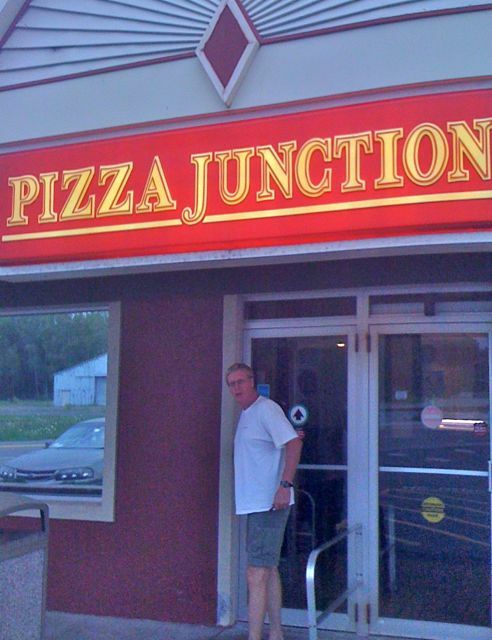 Since appearing on Triple D, Pizza Junction is no longer a dive. 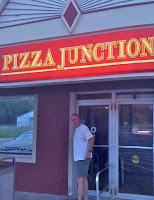 It's expanded into a nice establishment that still serves darn good pizza. I don't usually take pictures of food. But, I couldn't resist capturing this work of art. From Michigan's thumb we moved south and west a bit to Hartland, which is on the northern edge of the suburbs of Ann Arbor. 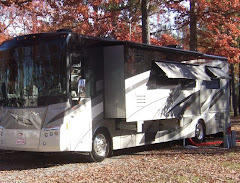 The purpose of our trip was to catch up with fellow road travelers Karla and Eric. We met up with this fun couple last winter in Port Aransas and were eager to see them in their spot for this summer at Waldenwoods, a four-season RV resort and conference center. Being back in the 'burbs for the first time in a long time, we've taken advantage of nearby shopping and stocked up on lots of things. We spent much of the day in Brighton, the next town to the south, stimulating the economy there. We're happy to do our part! 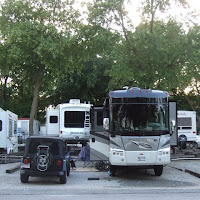 Tonight we joined Karla and Eric for the short trek back to Brighton for dinner and a meetup with another RVing couple, Sue and Paul. (That's them on the right.) 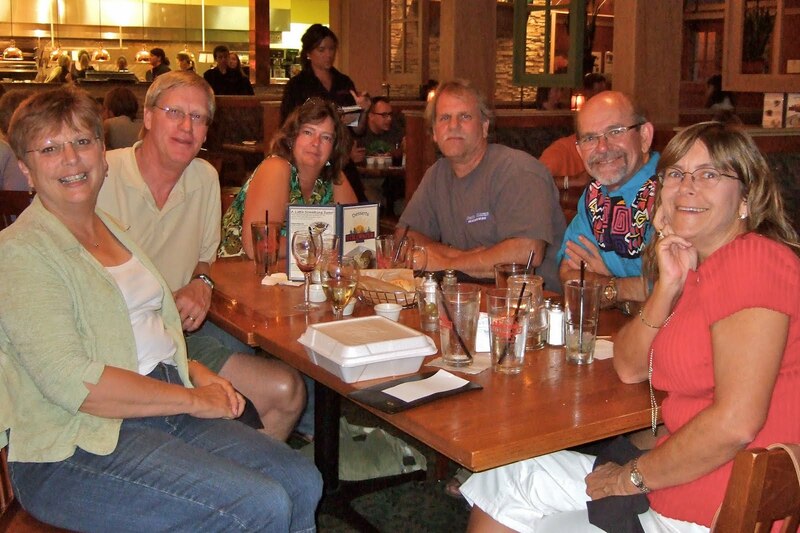 Over tasty faire at the Stillwater Grill, we enjoyed fun conversation and lots of laughter. Thanks, y'all for a wonderful evening! Our time here in Hartland has been short, but lots of fun. We're heading east tomorrow. Stay tuned for our adventures beyond "the hand". When I called to make reservations at Oak Beach County Park, the recorded message threw me for a loop. It said, "We have no sites available for the weekends of Cheeseburger." Thankfully, the friendly voice went on to say that a few sites were available during the week. And, for us, that was definitely good news. Though we still had no idea what "Cheeseburger" was, we were grateful that we could grab this cozy spot for a couple of nights. It's just a short walk from the lake and less than a mile from our friends' place here in Port Austin. And, the price is right. Full hookups and a clear shot at the satellite for a mere $25 a night. Deal! 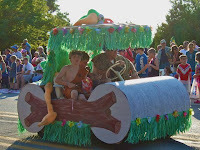 The park, like most of the town, was decked out for this thing they call "Cheeseburger". We kept an open mind and checked in with our friends Pat and Ed. They were definitely in the Cheeseburger spirit at their house. 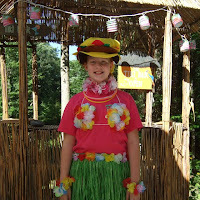 The tiki bar was in place and images of pink flamingos could be found all around. 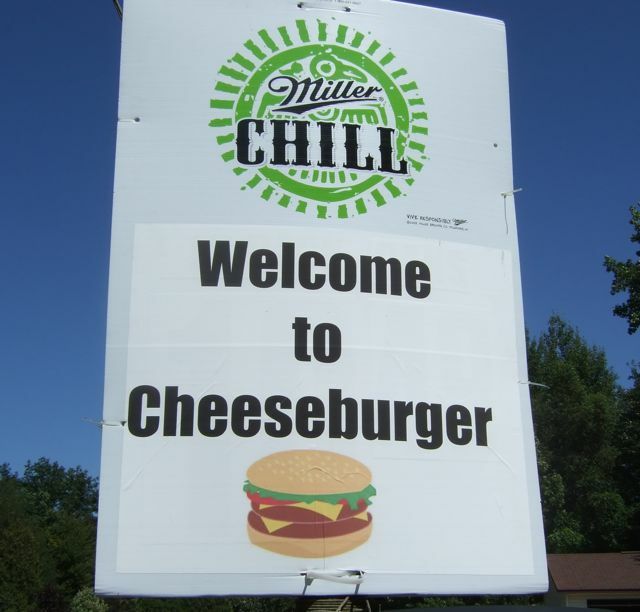 We didn't know much about Cheeseburger, but we were quickly figuring out that it's some kind of party. 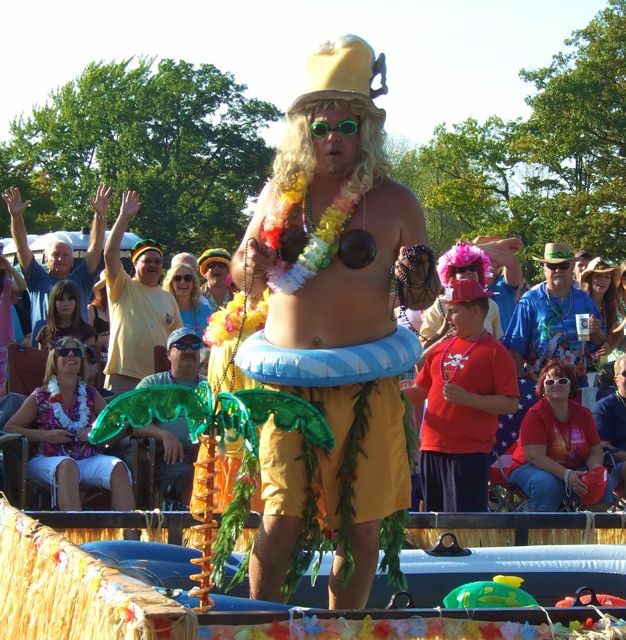 By the time Wednesday rolled around it was time to get ready for the Parade of Tropical Fools, the midweek highlight of Cheeseburger. Yesterday, Paul and Ed went to town bright and early to place our chairs along the route. By 9AM the locals estimated there were some 15,000 chairs lining the parade route. And, the parade wouldn't start until 6PM! 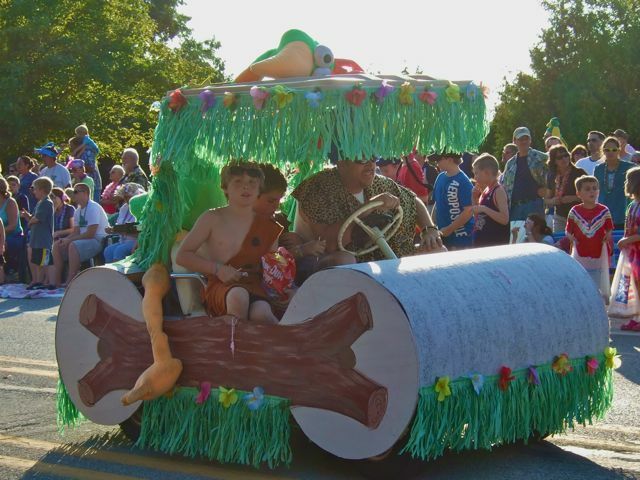 When Pat and Ed's niece Alyssa donned her costume for the parade, we knew we were in for something fun! 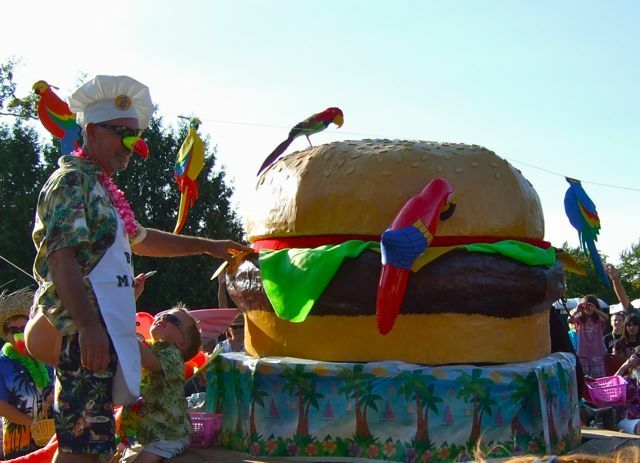 Turns out that "Cheeseburger" is short for Cheeseburger in Caseville, a 10-day festival of everything Caribbean and, oh yeah, cheeseburgers. 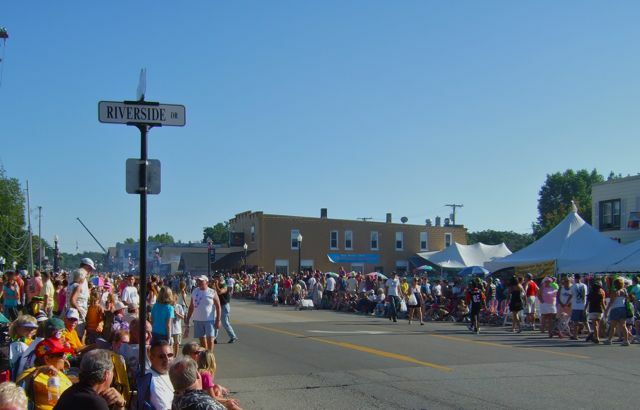 Caseville is a quiet little village that some 900 people call home. 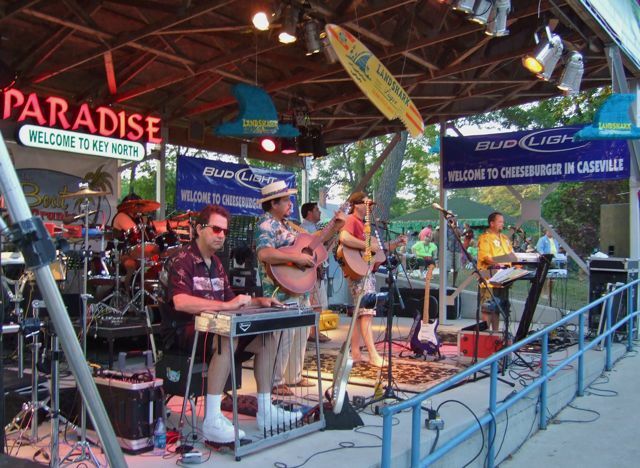 But, every Summer this little place on the shore of Saginaw Bay becomes the spot where Jimmy Buffet meets Mardi Gras, with a Cheeseburger, of course. 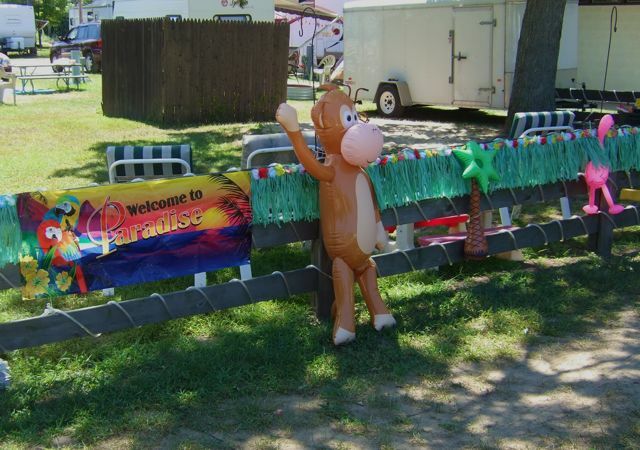 From its humble beginnings in 1999, when some 5,000 people came to town to eat cheeseburgers and act like parrotheads, Cheeseburger has grown. 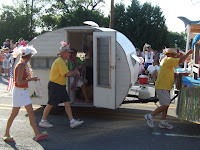 Official attendance estimates for this year's parade were between 60,000 and 70,000 parrotheads. 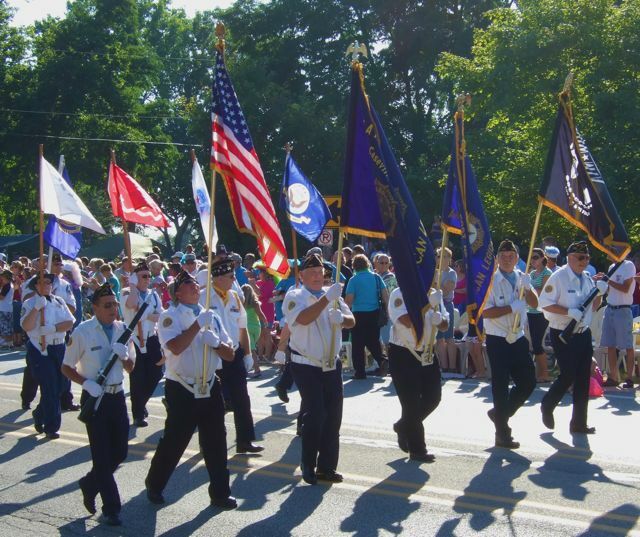 The parade started like most parades, with a military color guard that received a standing ovation from the crowd. Beyond that, it was like nothing we've ever seen. 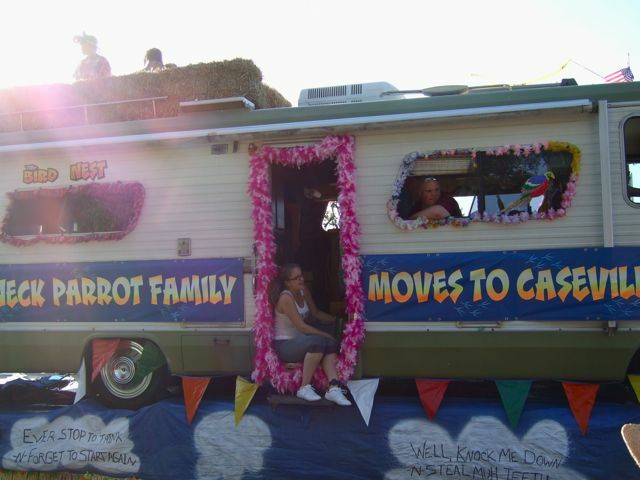 This little trailer served as a bead closet for this float. 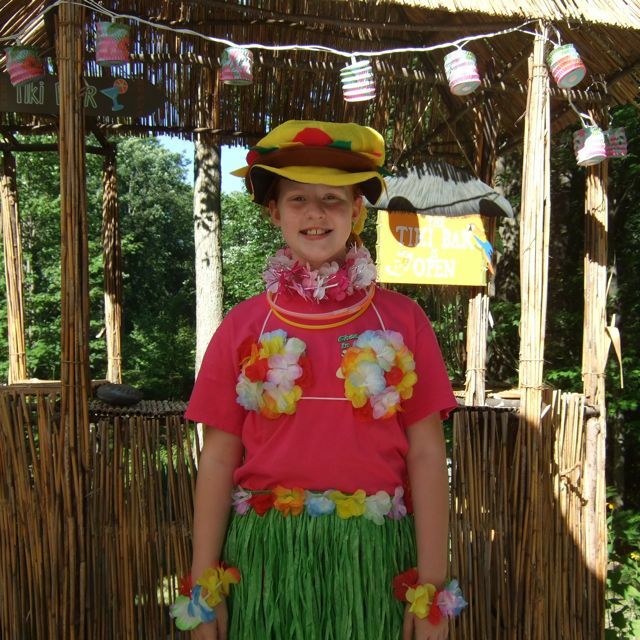 When we said this is Jimmy Buffet meets Mardi Gras, we weren't kidding. 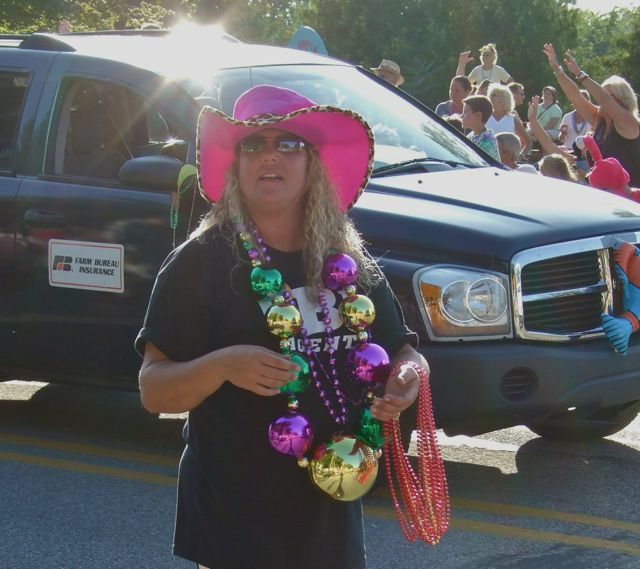 There were lots, and we mean, lots of beads. Yes, LOTS of beads! And, some of them were big! 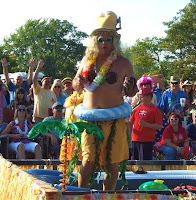 After the parade we moved into the amphitheater to enjoy the music of The Boat Drunks, a Jimmy Buffet tribute band out of Champaign, IL. They were lots of fun! 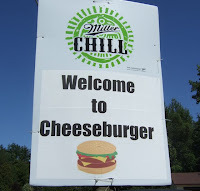 And, of course, we all treated ourselves to a tasty cheeseburger and a brew (or two) while we were initiated into the "parrothood" up here in Key North. Yes, we're a little bit sad we had to leave this morning. These folks in the thumb sure know how to have a good time. We'll definitely be back! 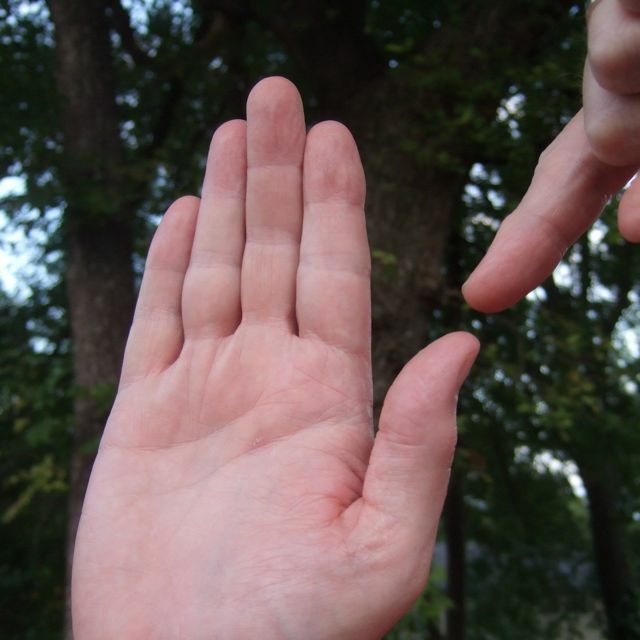 If you ask a Michigander where he or she is from, you'll get "the hand". Yep. They will raise their right hand and point to the place they call home. That's right. On their hand. You see, Michigan - at least the lower peninsula - closely resembles your right hand. Check a map if you want, but we're absolutely correct on this one. Some Michiganders will position their left hand perpendicular to their right with their fingers nearly touching. The left hand is supposed to represent the upper peninsula. Anyway, we've made our way from the "tip of the mitt" to the "tip of the thumb", Port Austin. We're here for a few days to see our friends Pat and Ed, whom we met it Port Aransas. And, we can see why they love to call this place home. It's something special, indeed. Pat and Ed showed us around Port Austin and many interesting parts of "the thumb". 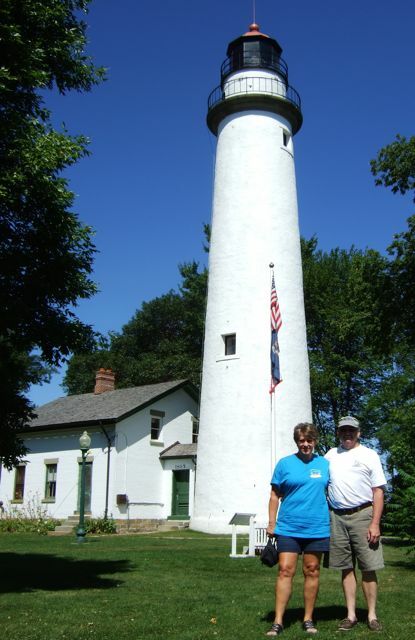 The jewel of Huron County is the Pointe aux Barques lighthouse on the shores of Lake Huron. The lighthouse was originally commissioned in 1848. After a fire in the keeper's house, the house and tower were rebuilt and this lighthouse has been shining since 1857, making it the oldest continuously operating lighthouse on the Great Lakes. 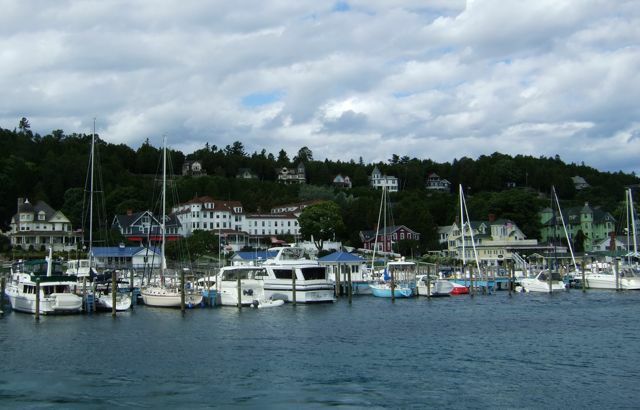 Port Austin is a cute town that is working hard to keep itself lively and vibrant. As Pat and I browsed through a lovely gift shop above the town hardware store, this little plaque caught my eye. Thanks, Pat and Ed for your wonderful hospitality. We look forward to seeing you down the road soon. 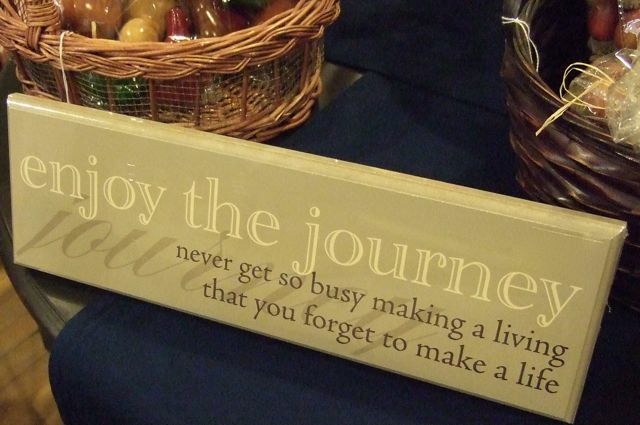 We are definitely enjoying the journey! Today was all about boats and bikes. We hopped on our bikes this morning and rode down to the ferry terminal. 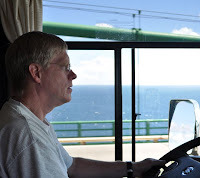 We arrived just in time to board a ferry and head to Mackinac Island, four-square-mile island that sits between the Straits of Mackinac and Lake Huron. This trip was more than 24 years in the making! Once upon a time, we considered Mackinac Island as a honeymoon destination. We built a new house instead, and vowed that one day we'd make it to the island. Today was the day! Yesterday's wild wind was mild compared to today. 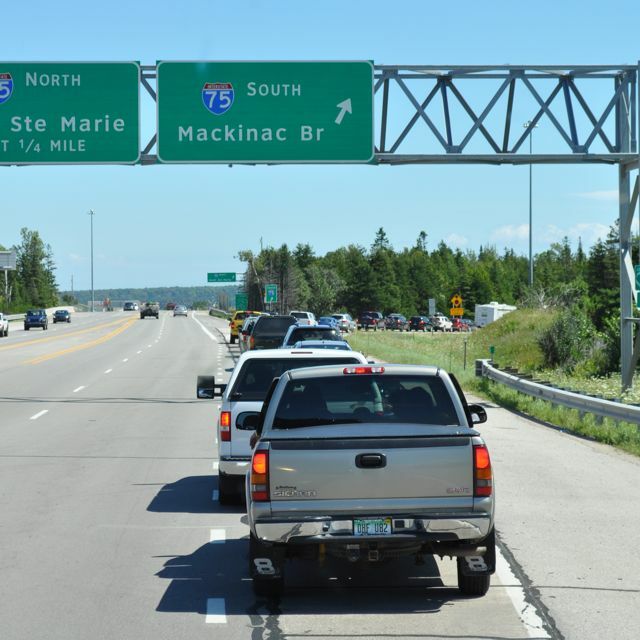 It looked like traffic was being escorted across the Mackinac Bridge. 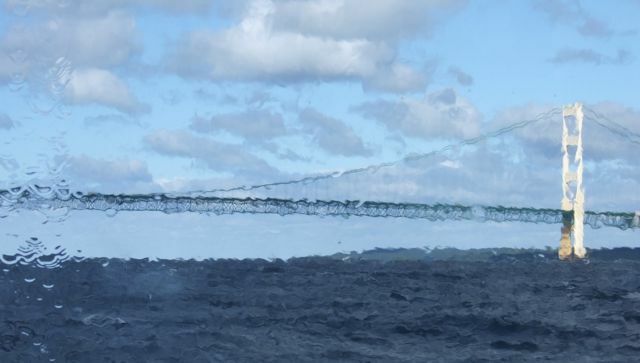 But, we couldn't be sure because the waves were washing over the ferry and making a mess of our view. This photo brings new meaning to the word "watercolor". After 20 minutes of rocking and rolling, we pulled into the harbor. Despite the wind, today looked like a perfect day to explore the island. 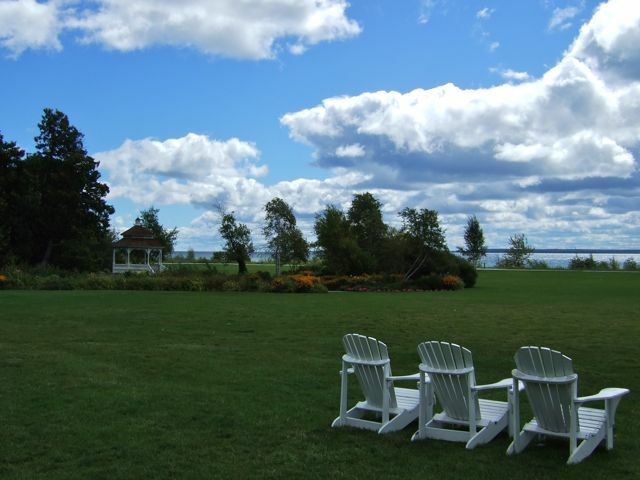 When you step onto the island, you step back in time. Cars are forbidden. 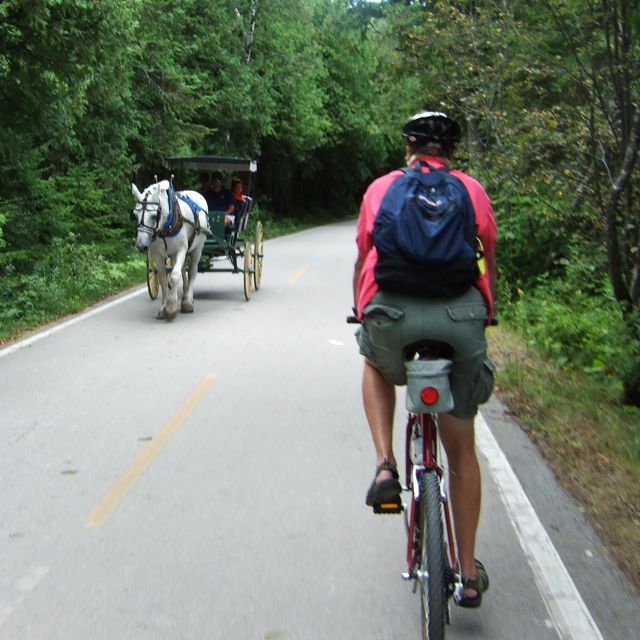 The only modes of transportation are horses and bikes. When we first stepped off the boat, though, there were too many of both around. It was a zoo! Ah! That's more like it. 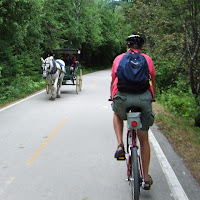 Within minutes we were enjoying the peace and quite of State Highway 185, an 8-mile stretch that circles the island. It was lovely. There are several spots on the island that are tourist magnets, and there are others where few folks seem to stop. This lovely park on the shore of Lake Huron was very quiet today. We could have spent hours here. But, we had geocaches to find! 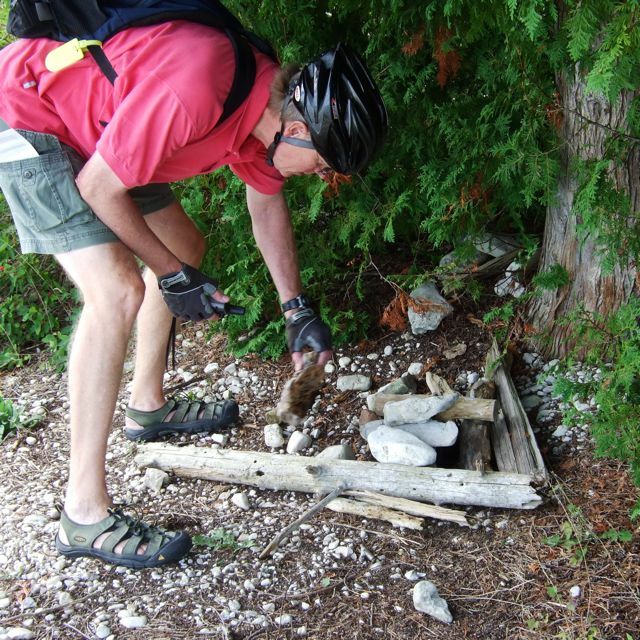 We were on a mission to locate 14 caches along the lakeshore around the island. And, they were all very simple. When you see a neat and tidy pile of rocks and driftwood like this one, it's pretty obvious that it's home to a cache. 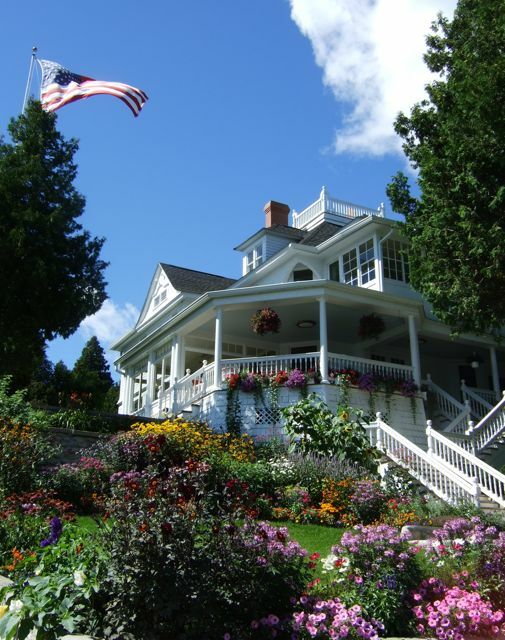 We climbed a couple of long sets of stairs up to Lakeview Drive in search of one cache and instead found another at the corner of this stately Victorian. The house, gardens and views were gorgeous. And, we found 15 out of 14 caches. That's some kind of record! Looking at the house next door, this could be a scene from the early 20th century. 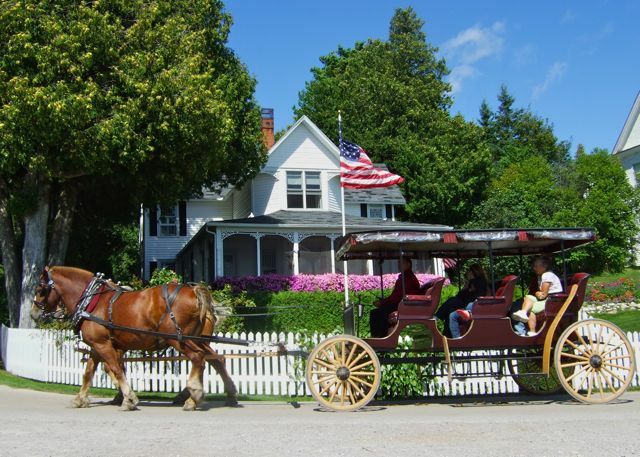 But, this is modern day Mackinac Island! 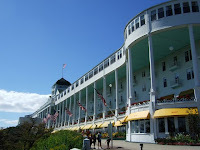 Mackinac Island's centerpiece is the Grand Hotel. Built in 1887, it bills itself as America's Summer Hotel and boasts having the world's longest porch. At 660 feet, we won't argue. However, we did decide to pass on the $10 admission fee to enter the property and the $50 lunch buffet. We enjoyed a peek at the hotel's tea garden and went on our way. 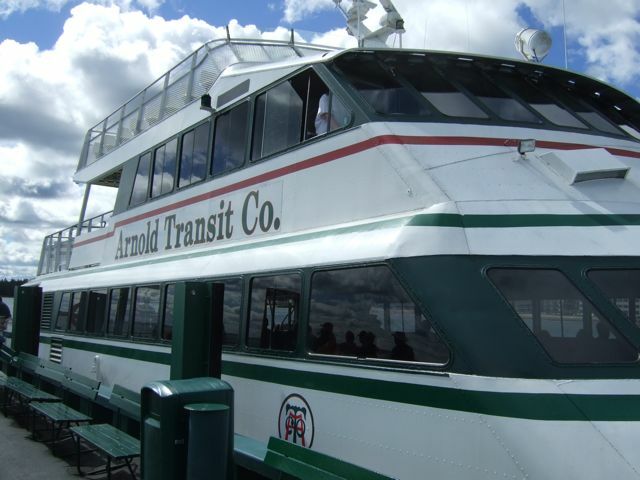 In our opinion there's much more to see and do on the island. And, our picnic lunch by the shore was much more comfortable! 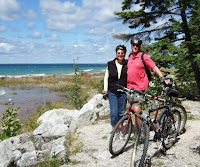 With eight miles of riding and 15 caches and limitless views behind us, we had a great day on Mackinac Island. It was a delayed honeymoon visit, but for this happy couple it was well worth the wait. Before we move on down into the "hand" of Michigan, we wanted to get something straight. 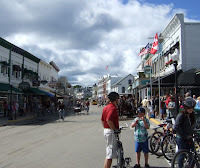 Is it Mackinac or Mackinaw? We were very confused. We found the answer. 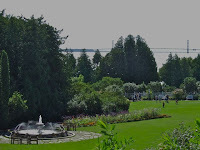 The bridge and the island are Mackinac. The city is Mackinaw. They're all pronounced "aw". Why? Because the French spelled it one way and said it another. The British spelled it the way they heard it. Apparently, the British named the city. 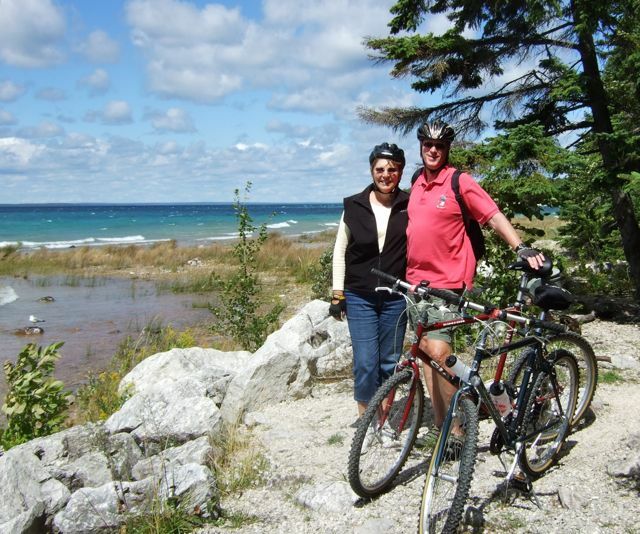 Our last day in the U.P. was a windy one. 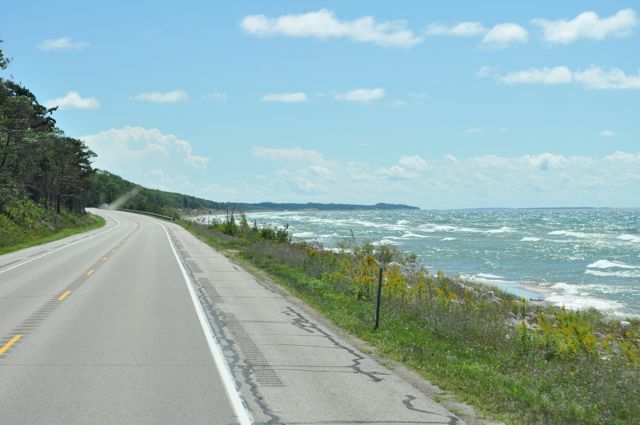 Driving along Highway 2 we watched the surf build on Lake Michigan. Some of those waves were big! With only 80 miles or so to drive today, we thought our travels would be short. 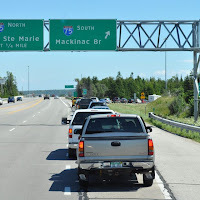 But, when we got to the exit to the Mackinac Bridge, this backup meant we had to wait awhile. The long lines of traffic on a Sunday afternoon reminded us of our days in the Bay Area. But, the most important item in this picture is that flag on the left side. We were in for one stiff cross wind! 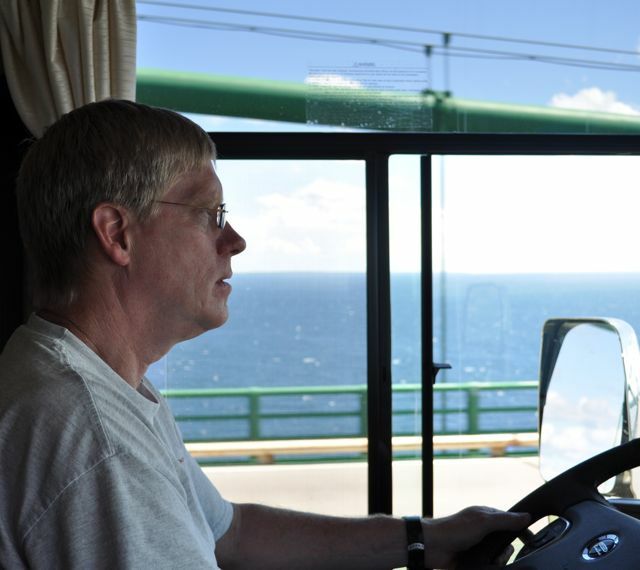 Paul steadied himself for the drive across the windy span. He looks like he's really concentrating, doesn't he? He was! 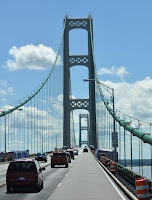 The Mackinac Bridge is four miles across. The wind was blowing so hard that when we passed the uprights the moose suddenly went silent. And with no wind for a moment, we nearly steered ourselves into the side. I think we took three, maybe four collective breaths as we made the crossing. 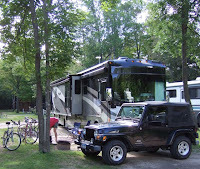 Within minutes of crossing the Mighty Mac we were parked safely in the KOA in Mackinaw City. We have a lot of exploring to do in a short time. So, Paul was quick to pull the bikes off the back and get them ready to ride. We took a quick cruise around town and made our plans for tomorrow's special trip. Stay tuned for more from the "tip of the mitt"!